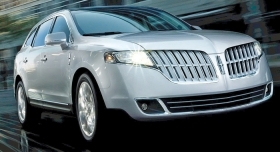 A version of the Lincoln MKT will be offered to livery fleets next year. DETROIT -- Lincoln plans to build two chauffeur-dedicated MKT Town Car versions next year to replace the Town Car, its outgoing workhorse for livery fleets, which include vehicles such as standard-size executive cars and stretch limos. But questions remain as to whether the fleet market will embrace the replacement or turn to rival brands’ vehicles for the chauffeur segment. On Feb. 14, Ford Motor Co.’s luxury brand revealed a prototype of the MKT Town Car at the 2011 International Limousine, Charter and Tour Show in Las Vegas. Ford previously said it would rely on the MKT platform, but had not given a name for the vehicle. By modifying its MKT crossover, Lincoln will try to fill the gap left when the Town Car is discontinued in September. The livery version uses a standard MKT chassis and is available in front- and all-wheel drive. The limousine version has a heavy-duty MKT chassis with standard awd and a stretched-wheelbase conversion that can add up to 10 feet in length. Both versions will include Sync technology, rear and blind-spot cameras and reconfigured interiors to allow for more passenger room, Lincoln said. The immediate response from the livery industry was lukewarm. George Jacobs, CEO of Windy City Limousines, said the Lincoln MKT misses the mark. Jacobs, whose Chicago fleet of 160 vehicles includes 70 Town Cars, said the MKT lacks styling and room, while a curved trunk doesn’t fit the needs of most passengers. Kane, whose fleet of 120 vehicles includes mostly General Motors Co. vehicles and no Town Cars, said he would consider the MKT Town Car, but he’s also looking at Mercedes and Toyota vehicles. Built on the same platform as the Ford Flex, the 2011 MKT has a starting price of $45,035, including delivery. Lincoln did not list the price of the converted MKT, but said it would be comparable to a Town Car, which sells for $46,995 including delivery. In an attempt to gain sales for the crossover, Ford has said it also will offer conversion-ready kits to hearse builders. The MKT Town Car will be produced at Ford’s Oakville, Ontario, assemblyplant, alongside standard versions of the crossover, starting next spring. The Lincoln MKT crossover has been a weak seller since its 2009 debut. In 2010, sales totaled just 7,435, accounting for only 9 percent of Lincoln sales and less than 1 percent of Ford’s total U.S. sales. In January, Ford sold 390 MKTs, down 46 percent from January last year.